Ann Hu’s Shadow Magic (2000) is an evocative homage to the introduction of the moving image in China. The film opens in Imperial Peking in 1902 with the elaborate arrival of China’s eminent opera star Lord Tan (Li Yusheng) to the Feng Tai Photo Shop, where he is to be photographed by the shop’s chief photographer Liu (Xia Yu). However, Liu is more concerned with the innovation of the phonograph he has recently discovered than the commotion surrounding Lord Tan’s arrival. The young photographer’s fascination with Western inventions precipitates his alliance with the threadbare Englishman Raymond Wallace (Jared Harris) who has come to China to introduce the first moving image in the hope of making a great profit. Liu’s avid desire to share in the magic of Raymond’s silent cinema is belied however by the Chinese community who detest Westerners and their technological ‘tricks’. The animosity felt towards foreigners is evidently a result of the Boxer Rebellion in which the Boxers, a secret Chinese society (that came to be supported by the imperial government), clashed with eight of the world’s major powers over the Boxers’ desire to evict all foreigners from China. Notably, the Boxers’ vocal hatred for Westerners was concentrated in a few key areas, most particularly Peking. Nevertheless, the allied powers’ response to the rebellion was decisive and in 1901, foreign diplomats ordered troops to enter and occupy Peking, leading to the Boxer Protocol of 1901 in which various restrictions and decrees were placed on China. Consequently, the character of Liu is caught between his country’s instinctive aversion to foreigners and his own aspiration to overcome cultural barriers in his embrace of Raymond’s silent cinema. He risks his friendship and loyalty to his employer Master Ren (Liu Peiqi), his love for Lord Tan’s daughter Ling (Xing Yufei) and his filial duty to his father Old Liu (Wang Jingming) in order to learn the Westerner’s novel device. Shadow Magic has been labelled Ann Hu’s valentine to the early existence of cinema in China. Certainly, there are several moments that depict the beguiling effect of the moving image on the local audience that Liu gathers. The vocal spectators that panic with the image of a train coming towards them and laugh at the actors’ frivolity on screen soon become accustomed to the captivating qualities of the silent cinema. They are bemused by the cinema’s technology but equally exultant about experiencing its pleasures. However, Hu’s account of the introduction of cinema to China is simply the impetus for the universal story of cultures colliding and technology and tradition meeting. The East meets West dichotomy is employed throughout the film as Hu negotiates the ways in which cinema can bring the two cultures together and bridge the cultural divide. Differences between Chinese Confucian ideology and Western ideas on love, friendship and responsibility are examined as Liu and Raymond share their thoughts and experiences. Raymond who espouses individual autonomy and subsequent freedom of choice challenges Liu’s loyalty to the traditional Confucian patriarchal family system that places respect for elders and principally the head patriarch of upmost importance. When Liu tells Raymond of his profound love for Ling and his father’s wish for him to marry an older widow, Raymond knowingly tells Liu to follow his heart and marry the woman he loves. Likewise, when Raymond asks Liu to be his full time partner and leave the Feng Tai Photo Shop, Liu is forced to compromise his duty and loyalty to Master Ren, qualities that he believes define a person’s integrity and honour. Raymond is not insensitive to Liu’s respect for Confucian ideology or the differences that separate their cultures, yet he is rather myopic in his view of cinema as a non-culturally specific creation. Thus, both he and Liu share a vision that transcends cultural boundaries and places emphasis on the modern technology of filmmaking. Significantly, this vision comes during a transitional period for China when the country is slowly facing change and modernisation. Liu informs Master Ren that he has heard that “the day will come when men can cut off their pigtails and women can unbind their feet”. The threat that cinema poses to traditional art forms is explored via Lord Tan, played by Li Yusheng who is himself a distinguished Beijing Opera star. The scenes in which Lord Tan performs before a captive and enthusiastic audience reveals the vibrant and enchanting qualities of Beijing Opera. Lord Tan’s operatic composure is combined with colourful and intricate costumes and choreographed movement that competes strongly with Raymond and Liu’s cinematic fare. Hu effectively and fittingly includes the recognition of this highly dramatic and elegant art form and the hope of it co-existing with the new form of entertainment. Ling reiterates the importance of her father’s operatic practice when she speaks to Liu about the modernisation of entertainment in China. She asserts that there will be many films to come but only one Lord Tan and that the tradition of opera will maintain longevity as its audience will remain loyal and dedicated to the art form. Notably, Lord Tan was eventually to become the star of China’s first motion picture film in 1905, an adaptation of the Chinese opera ‘Ding Jung Mountain’. Whilst Shadow Magic successfully re-creates Beijing at the turn of last century and remains true to the film’s cherished premise, it does not always sit comfortably or confidently between its different concerns. Hu’s chronicle of the advent of cinema in China is merged with the sub-plot of cultural diversity and the love story between Liu and Ling. A lack of direct historical information often leads to a melodramatic foray that risks losing the film’s thread. What seems an opening for a nostalgic yet historically informed epic gives way to a sentimental yet not fully realised film text. At times, the characters appear victims of cliché and confined to narrative formulas. The incidental relationship between Liu and Raymond develops at a sporadic pace with the character of Raymond never fully developing past his awkward dialogue with Liu. Shadow Magic is based on the true story of a photographer who worked at the Feng Tai Photo Shop and some unidentified Westerners who first brought cinema to China. Hu’s decision to explore the early stages of China’s cinema history rather than the production of China’s first narrative film is valid and compelling. However, Shadow Magic‘s overt homage to Giuseppe Tornatore’s Cinema Paradiso (1988) does not always ensure innovation. 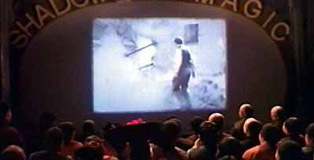 Hu’s film not only recalls Cinema Paradiso‘s soundtrack by Ennio Morricone, but also employs some of the film’s character and narrative tropes. Whilst Cinema Paradiso recounts the effect cinema has on a young boy named Toto (Salvatore Cascio) who lives in a small Sicilian town, Hu explores the impact cinema has for a young Chinese photographer in Peking. Nevertheless, the character of Liu evidently shares some striking resemblances to Tornatore’s protagonist Toto. For example, both characters fall in love with a female of higher social standing and both of their infatuations are reciprocated in the projection booth whilst the film plays to an enthusiastic audience. Hu’s attempt to perhaps honour the intensity and radiance of Cinema Paradiso unfortunately falters as Shadow Magic does not contain as many subtle nuances as Paradiso, nor is it as compelling. Where Shadow Magic excels is in its confident evocation of Peking in 1902. The elaborate set design and costumes denote a lavish visual production. In addition, the spectator is given some delightful glimpses of archival footage of Old Beijing such as the pan across the Forbidden City. Another immense pleasure is the excursion Liu and Raymond make to the Great Wall. The breathtaking expanse of the Wall is momentarily captured as Liu and Raymond record their own footage. These scenes also provide the spectator with authenticity and an intense symbol of China’s incredible history. Hu’s retrospective gaze to tell the story of the first moving image in China is extremely worthy and valuable. Her own Chinese-American heritage undoubtedly informed the sense of overcoming cultural boundaries that appears a central concern of Shadow Magic. After surviving the Cultural Revolution under Mao Tse-Tung, Hu eventually travelled to New York where she studied business administration and after a career in this area, turned to filmmaking. Her dual identity and understanding of both Eastern and Western values and philosophies has evidently informed her debut feature. Shadow Magic‘s status as an international co-production is also symbolic of the film’s fusion of cultures. It was the first official co-production to take place between the Beijing Film Studio and Taiwan’s Central Motion Picture Corporation. It was also produced by C & A Productions, Schulberg Productions, Post Production Playground, China Film and additionally funded by Wim Wenders’ Road Movies. The array of different investors is testament to the film’s evocative and ambitious subject matter. Clearly, the well-explored theme of conflict between cultures and tradition and modernity finds exposition in Shadow Magic. Hu attempts to strike a balance between the Chinese and Western ethos without greatly compromising one over another, or at least attempts to depict each cultures’ growing awareness of the inherent differences but also similarities that exist between the two. At one screening in which a Western family gather, a local woman comments that she never imagined the foreigners as having families. Another surprised spectator acknowledges that Westerners actually do have a sense of humour. Ultimately, therefore, the visually rich Shadow Magic must be celebrated as both an account of the introduction of cinema to China as well as an examination of the conflict between cultures and technology that this modern innovation inspires.